WGSN leading online trend-analysis and research service which provides creative and business intelligence for the apparel, style, design and retail industries, launched the 2011 WGSN Global Fashion Awards, sponsored by SWAROVSKI ELEMENTS, in London on the 20th June, 2011 at St Martins Lane. A select guest list of 150 had been invited to witness the unveiling of the shortlist of nominations. 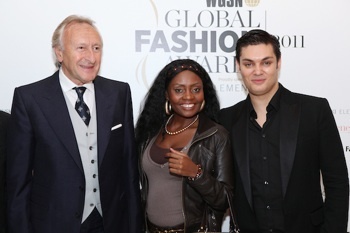 Among the attendees: Harold Tillman, chairman of the British Fashion Council (see photo, left); Susanna Kempe, WGSN CEO and 2010’s ‘Most Influential Footwear Designer’, Nicholas Kirkwood. Created by WGSN in 2010, the awards look to accredit the industry’s most inspirational and innovative, recognising those who are pushing the boundaries of fashion. Following the London launch, winners will receive their awards at a ceremony due to take place at Gotham Hall in New York City on the 20th of October 2011, in front of an international audience of fashion’s most influential industry insiders.